UMBC’s Lee Blaney is known for his innovative research on water and soil contamination, working to keep people and the environment healthy. His latest project takes that focus in a new direction by developing an innovative system to recover nutrients from an unexpected source: human urine. Blaney, associate professor of chemical, biochemical, and environmental engineering, received a phase one grant from the Environmental Protection Agency’s People, Prosperity, and the Planet (P3) program to investigate the ability of his Nutrient Extraction and Recovery Device (NERD) technology to recover nutrients from human urine. Blaney worked with co-PI Marc Zupan, associate professor of mechanical engineering, and ten UMBC students to develop a system that can recover around 90% of the phosphorus, an ecologically important nutrient, and some of the nitrogen and potassium from collected urine samples. These nutrients can impair water quality by causing the formation of dead zones in places like the Chesapeake Bay and Gulf of Mexico, so developing a low-cost way of removing them from urine could have a major impact. All P3 projects are required to include an educational component, to ensure researchers are sharing knowledge about the environment and sustainability. The student role in this particular project is significant. 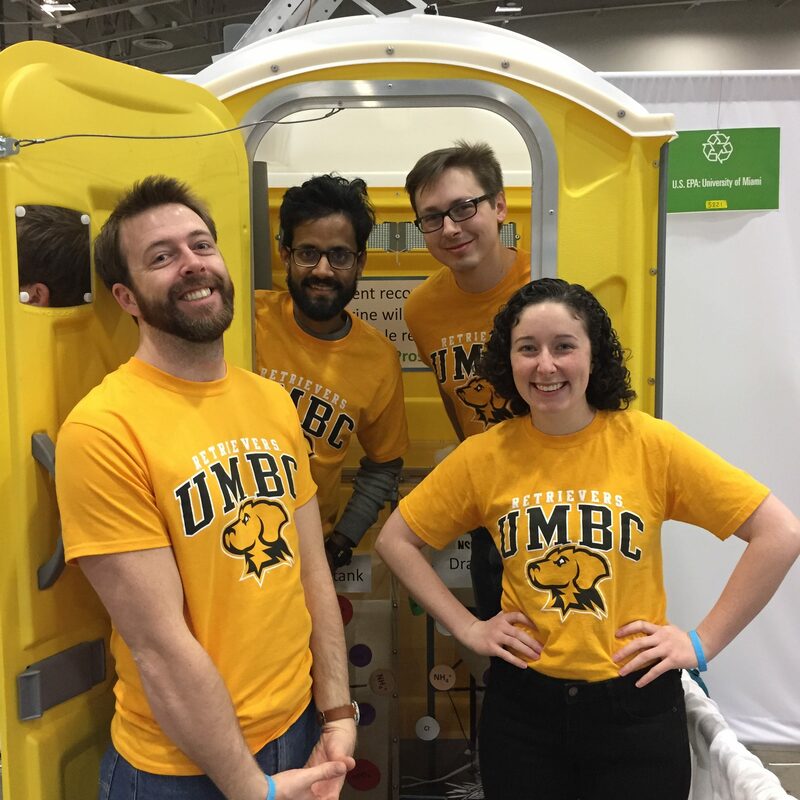 Both undergraduate and graduate students have worked to develop and institute the NERD technology, which modified portable toilets to collect and process urine samples. In April, several students presented their work at the USA Science and Engineering Festival in Washington, D.C.
Students in Lee Blaney’s lab presenting at USA Science and Engineering Festival in Washington, D.C. Photo courtesy of Lee Blaney. NSF recently produced a video about research being done in Blaney’s lab. The full video can be viewed on the NSF website. Banner image: Lee Blaney. Photo by Marlayna Demond ’11 for UMBC.